Talisay City -- Undefeated prospects Anthony Marcial and Jonreil Casimiro both registered knockout wins during last night's 'Fight Night in Talisay' over their Thai opponents to capture their first regional titles before a jampacked crowd at the Talisay Sports Complex here. 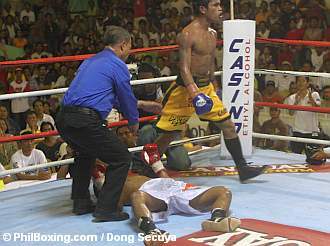 Marcial (10-0-0 9KOs) used brute force and huge size advantage to overpower his smaller but game Thai opponent Thongthai Rajanondh (17-8-0 4KOs) sending Rajanondh to the canvas in the first round before Referee Teddy Alivio waived Rajanondh out of the contest at 1:49 in the 3rd round when the Thai went down in the neutral corner from Marcial's barrage of punches. The stoppage however drew catcalls from the crowd as Rajanondh appeared to go down more from a slip than from a powerful blow as Rajanondh protested the referee's decision. 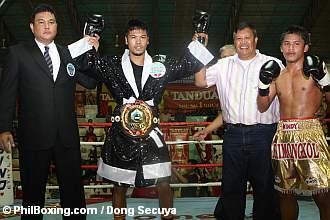 With the win, Marcial is now the Interim WBO Oriental superfeather title holder. In the co-main event, Johreil Casimiro (11-0-0 6KOs) sent Liempetch Sor Veerapol (11-3-0 7KOs) to the canvas in the 2nd and 4th rounds before Referee Tony Pesons stopped the contest after Veerapol's 3rd knockdown at 1:02 in the 5th round. Casimiro captured the WBO Asia-Pacific Junior Flyweight Crown with his impressive win. 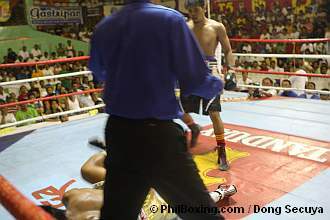 In the main undercard, Rey Labao was initially declared the winner after his opponent Darryl Pucdol did not get up after receiving a low blow in 4th round but the GAB supervisors reversed the decision after the night's final bout when it was announced that Pucdol won by disqualification. 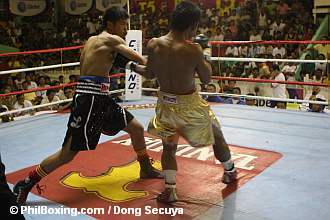 Top and above photos: Marcial (L) tags Rajanondh with a solid right to send the Thai to the canvas in the first round. Marcial (2nd from left) wins the WBO Oriental Interim title as his hands are raised by WBO Vice-President Leon Panoncillo (L) and promoter Sammy Gello-ani. Jhonreil Casimiro (R) heads to a neutral corner as Referee Tony Pesons readies to administer the count on the fallen Liempetch Sor Veerapol of Thailand. 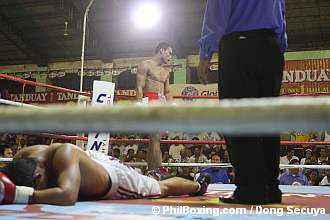 Darryl Pucdol lies flat on the canvas in pain after being hit a low by Rey Labao (C).